I ran all over town for two weeks, shopping at every place I could think of that carries ready-made drapes. I spent countless hours and used a lot of gas. I ultimately purchased 4 different pairs of drapery panels and eventually returned 3 of them. Then I asked my husband to install them. Which he did… 2 weeks later. 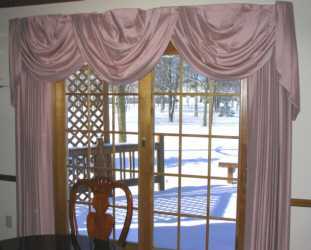 And he installed the rods 5” too high so my drapery panels are now ready for flood waters. You know… just in case. They don’t really block out enough light so the house really heats up on sunny days. Sometimes it’s hard to see the TV, so I would have liked more light control. They are not lined & look terrible from the street when we pull in the driveway. And of course, my mother in law has told me that at least 4 times! I guess they’re OK. They are fine for now. I’ll just change them out in a year or two. I called Marci and she came to the house a few days later. She asked me a lot of questions on the phone and many more once she got here. I felt like she really wanted to understand what I wanted. My husband likes to watch football on Sundays and the glare makes it painful. It also gets really hot in here in the summer. Marci assured us that (once she was finished) we could enjoy the sun and warmth when we wanted it, and keep the house cooler and the TV glare-free when we chose to. They are lined with some fancy lining. I don’t know exactly what but they look lush. 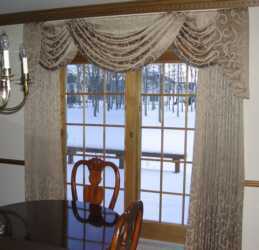 Everyone loves my drapes! Charlie was so nice, right on time & quick. He made it look so easy!